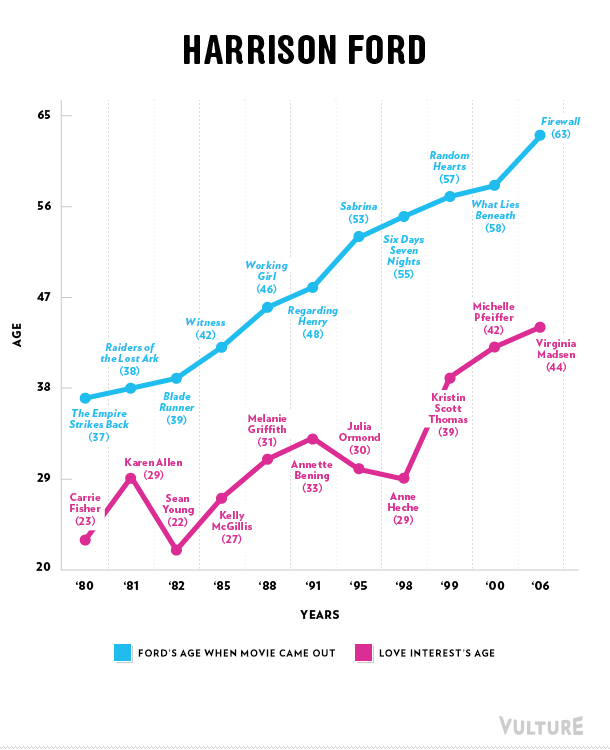 Leading men age, but their love interest don't. Kristen Stewart recently fell out of the con-artist comedy Focus after Will Smith replaced Ben Affleck as the male lead; according to Variety, she was nagged by “the feeling that the age difference between the two would be too large a gap.” For the record, Smith is a mere four years older than the 40-year-old Affleck, and if it seems a little odd that either of them would be considered a romantic partner for the 23-year-old Stewart in the first place … well, welcome to Hollywood. It seems like time and time again, male movie stars are allowed to age into their forties, fifties, and even sixties while the ages of their female love interests remain firmly on one side of the big 4-0, but is this a perception borne out of reality? To find out for sure, Vulture has analyzed the data of ten middle-aged leading men and the ages of the women they’ve wooed onscreen; you’ll see the results in the charts below. How’d we arrive at our conclusions? 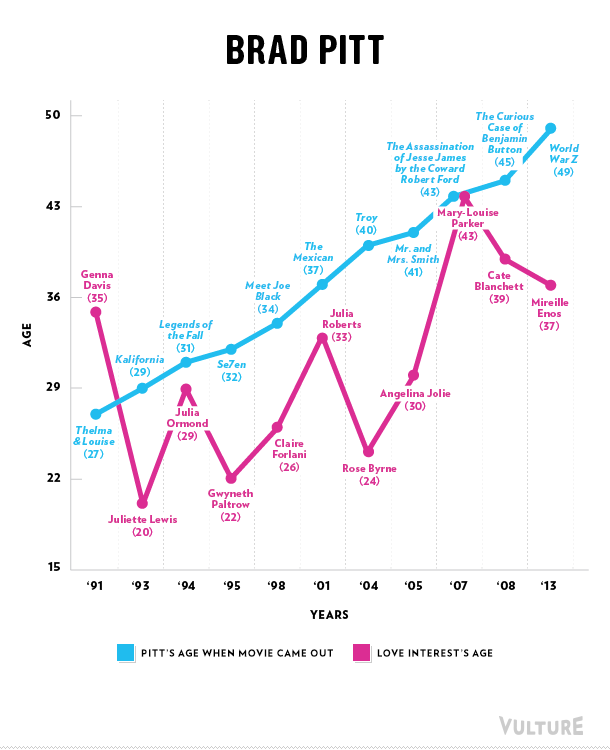 For each of our leading men, we tried to pick a representative sample of films—usually ten—where that A-lister had a notable love interest or wife, then we plotted the age gaps on our charts over the course of that star’s career. (Because production dates for older movies can be hard to come by, we measured the stars’ ages on the day the film in question was released.) The results confirmed our suspicions: As leading men age, their love interests stay the same, and even the oldest men on our list have had few romantic pairings with a woman their own age (or even one out of her mid-thirties). 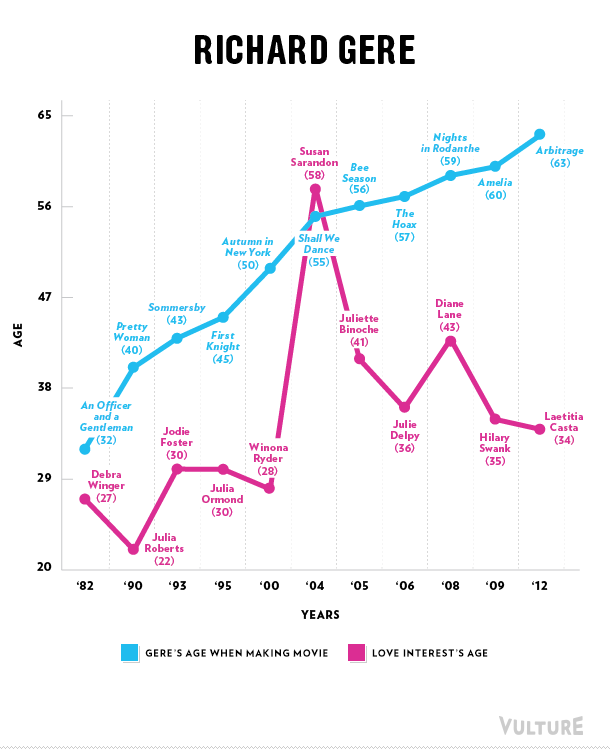 If our actor was sharing the screen with an A-lister of commensurate star power like Julia Roberts or Angelina Jolie, the age difference would drop somewhat, but in movies that relied solely on our guy’s big name, the lesser-known love interests would nearly always be decades younger. Denzel Washington’s pushing 60, but you wouldn’t know it from his love interests, who tend to stay 35 and under. 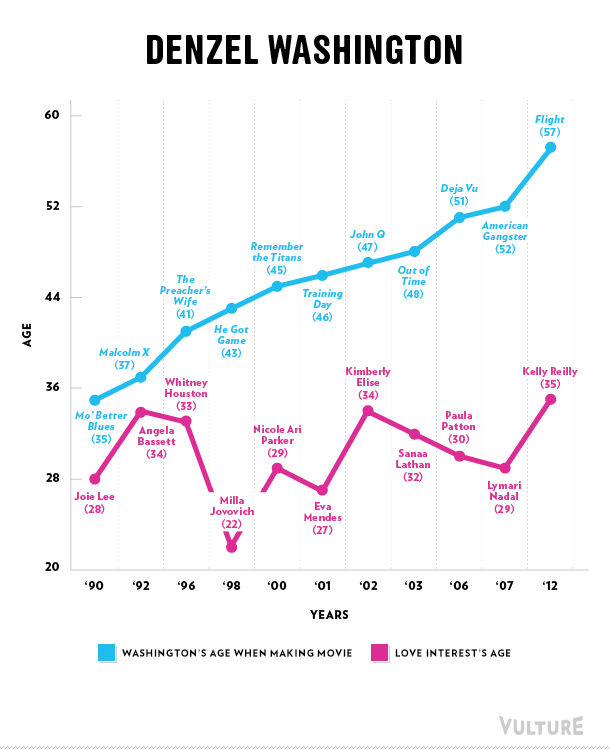 Perhaps that’s because Washington rarely gets to romance an actress as formidable as he is (a fact of life that may owe more to Hollywood’s racial prejudices than gender inequality), because when he went toe-to-toe with Angela Bassett for Malcolm X and Whitney Houston in The Preacher’s Wife, the age differences weren’t quite as egregious. (He did pair with Julia Roberts and Angelina Jolie when they were newbie superstars, but those films—The Pelican Brief and The Bone Collector—were cautious and chaste when it came to suggesting a love connection). The older Washington gets, the less it seems to matter to his love interests, as the last three notable ones—Paula Patton, Lymari Nadal, and Kelly Reilly—were all more than twenty years younger than he was. Johnny Depp likes ‘em young: Nearly all of his notable love interests have been 25 or under, and a few of them—including Winona Ryder, Juliette Lewis, Christina Ricci, and Keira Knightley (who shared a kiss with Depp in the second Pirates film)—would have been carded at the time they swapped spit with the star. In fact, the cradle-robbing Depp has only had two notable love interests in their mid-thirties, and all Juliette Binoche and Angelina Jolie had to do to make that cut is win an Oscar beforehand. Easy! Compared to Cruise, the women that George Clooney screen-dates are a smidge more age-appropriate (most of them are only eight or nine years his junior), and twice he even wooed actresses who were three older than him: Michelle Pfeiffer in One Fine Day and Holly Hunter in O Brother, Where Art Thou? 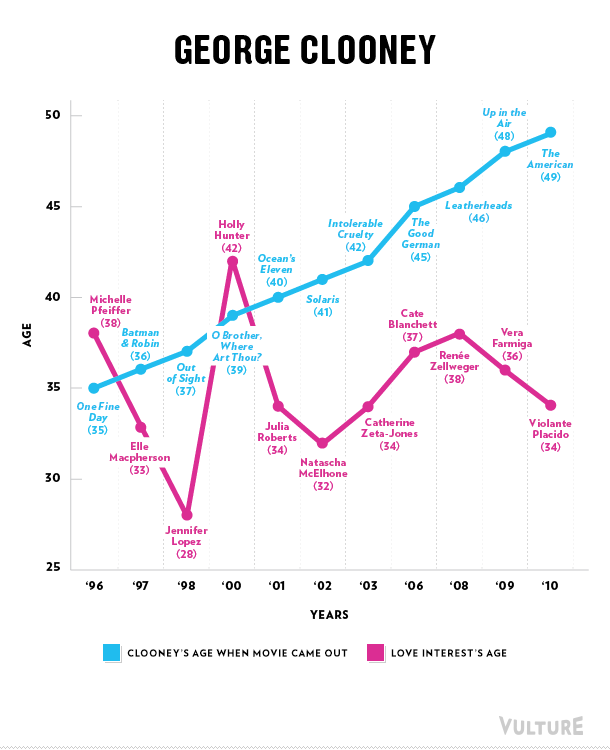 When it comes to co-stars, Clooney tends to have his pick of classy actresses in their mid-thirties, though as he gets older—Clooney will turn 52 in May—the age of his love interests still seems to have plateaued.